NaClO - Modern therapy for viral hepatitis. About me. My name is Roman G. Myazin. I was born in Volgograd city (Russian Federation) in 1975. In 1998 I graduated Volgograd State Medical University, Department of Propaedeutics of Internal Diseases with a degree: “General Medicine”. Since 1998 I have been working as practical therapist. In 1999 I graduated Intership at the Volgograd State Medical University on the basis of faculty of propaedeutics of internal Diseases on a speciality: “Therapy”. In 1999 I entered the Residency on the basis of faculty of propaedeutics of internal illnesses at the Volgograd State Medical University. During the time spent in the Residency I independently developed and practically introduced a new method of treatment of a chronic viral and non viral hepatitis, liver cirrhoses using a course of intravenous injections of Natrii Hypochloriti (NaClO) solution. At the same time I learnt the technique of laboratory tests with different parameters such as lipid peroxydase, antioxidative enzymes and liver-specific enzymes in blood plasma (in all 12 parameters which were innovation for the Volga region) among examined groups of the patients. That allowed revealing presence of disease on early stage of liver diseases. Since that time I have been treating patients, putting into practice a new method of therapy and also using diagnostics of patients clinical and laboratory tests. Also I have learnt and applied new methods of treatment with various kinds of laser therapy. 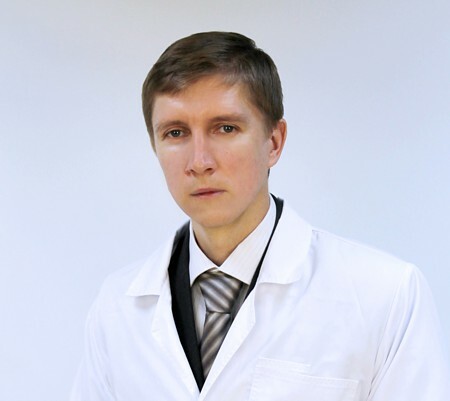 Having finished the clinical Residency in 2001, I have entered Postgraduate training for Ph.D. at the Volgograd State Medical University and went on my scientific researches on theme: “Using Natrii Hypochloriti in treatment of patients with chronic diffuse liver diseases”. Materials of the dissertation were presented on the several Russian and international conferences which took place in Volgograd, Rostov, Nizhny Novgorod, Saint Petersburg, Moscow. Since 2004 I have been working as a lecture and a member of a teaching staff at Department of Propaedeutics of Internal Diseases at Volgograd State Medical University, combining my scientific researches and teaching activity with a practical work as a gastroenterologist-hepatologist. In 2006 I received the patent of the Russian Federation for the invention: “The new method of treatment of patients with chronic diffuse liver diseases by application of a rate intravenous infusions Natrii Hypochloriti solutions”. In the same year I defended my master’s thesis: “Using Natrii Hypochloriti (NaClO) in treatment of patients with chronic diffuse liver diseases” and got Ph.D. in medicine. In 2008 I was given the supreme qualifying category on internal diseases therapy. In 2010 I was given the diploma on gastroenterology diseases therapy. I am a real member of Russian Society for the Study of the Liver. This Society is a part of European Association for the Study of the Liver (EASL). I have written and published 130 articles on various problems of clinical medicine, among them a several monographyes: “Radioisotope methods of research including methods of computer tomography”, “Method of Natrii Hypochloriti in therapy of patients with chronic diffuse liver diseases”, co-author of "Reference Book: Diseases usual and unusual" and others. Now I am guiding some clinical scientific researches of influence of new medical products and drugs in gastroenterology at our faculty of the Volgograd State Medical University. For several years I have been leading a study group of young scientists on our department. I am published the articles about a diet questions in a Health and Beauty magazine. Also I am regular took part in a programs on TV, devoted healthy life-style. Office Phone: +7 (8442) 98-92-95. Mobile Phone: +7 917 338-92-95. Russua, Volgograd, Central District, Medical Clinic: «South-Med», 15A Kubanskaya street. Surgery days for primary call: 8 (8442) 260-360. Tel. : (8442) 98-92-95 (works); 8 917 338-92-95 (cel. ).